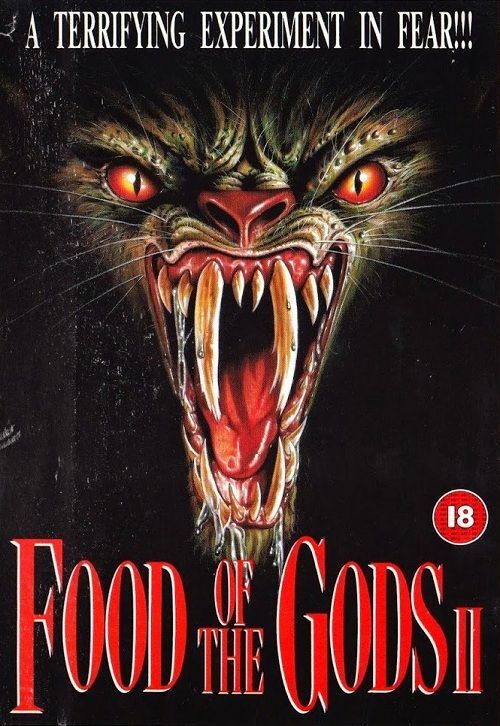 More than likely Gnaw – Food of the Gods: Part II (1989) was shot in 1987. 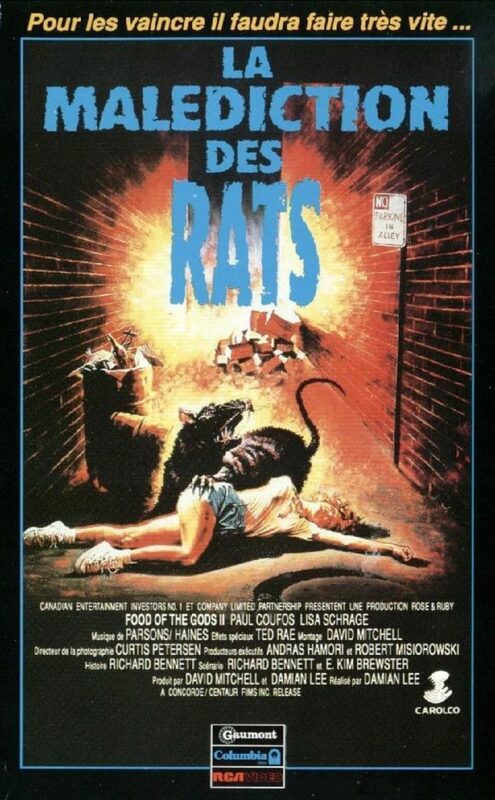 When I entered the film production program at York University, this was the movie we were told had just finished wrapping, and I found it amusing that a killer rodent movie and sequel to a mediocre yet culty AIP sci-fi flick takes place where myself and roughly 60+ other people would learn the skills to make good movies. Of course ‘good’ is relative (except when it’s anything made by Uwe Boll and Uli Lommel; their work is just out-and-out bad), and Gnaw in’t even good art, but it became an orphan CanCon film long ago for a variety of reasons: firstly, it’s schlocky, and was directed by marginalized genre writer-director-producer Damian Lee; secondly, the only source for North American TV and home video releases is a completely bungled full frame transfer. This scene nor any moment like this ever happens in the film. At no time does York University resemble Central Park. AT NO TIME. None of the puppets resemble this ghoulish mug. Again: this does not happen. She’s not in the picture. Gnaw‘s cast includes some recognizable faces from recent exploitation efforts (Paul Coufos, Lisa Schrage), and a handful of familiar character actors, many with lengthy & prolific careers in film, TV, and commercials (Jackie Burroughs, Colin Fox, and David Nichols), but it’s also a time capsule of York’s original spread-out Keele campus, with the Ross building as the centerpiece of its Brutalist design. York is filled with lore that’s been debunked as myth, but my favourite is the university’s architecture and spread out campus design stemming from an unbuilt complex for an American university in Arizona. There’s a Reddit poster that claims York is part of an unrealized extension to Berkely, and even if it were true, the pedestrian tunnels were designed to shield students from the cold; the ones we used didn’t have a mass of utility cables (except for one section with an intense steam pipe that ran under a building proper). The thickness of the concrete buildings and Ross’ bunker design is tailored to withstand the area’s wind, cold, and humidity over many years, which seems atypical for a Californian campus. The Ross may also have been erected as a central hub from which future department headquarters would be attached – an edifice that functions as the university’s centrepoint and point of reference for students in far off buildings erected in later years. It’s been said films become time capsules of styles, social norms, and the environs that inevitably succumb to development, and Gnaw is filled with a good representation of what existed in 1987, including genre conventions that qualifies Lee’s film as a classic 1980s tongue-in-cheek monster movie. 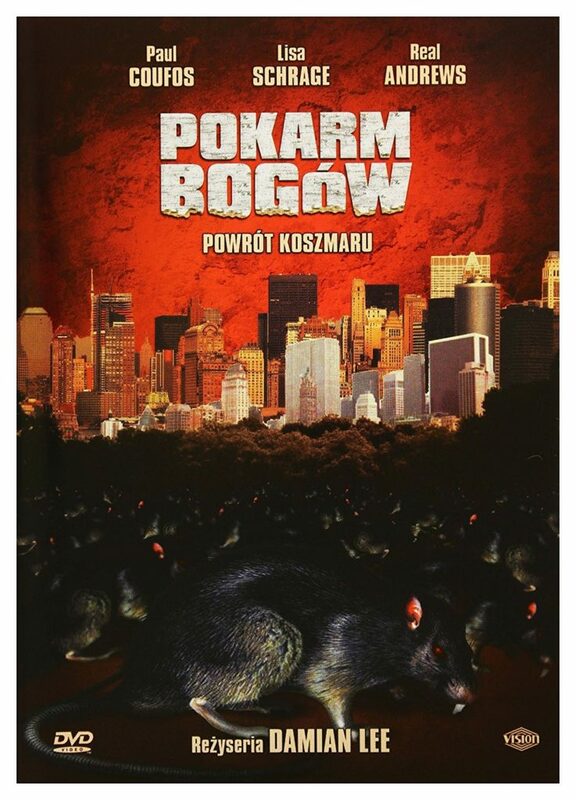 The hairstyles are big, the clothes triangular-based, and there are no mobile phones – but leading plantology egghead / humanity’s hero does use a snazzy Amiga 1000 to ‘crack’ the genetic code that ultimately unleashes the giant rats. The Amiga 1000, used by our hero in Gnaw – Food of the Gods: Part II (1989) to isolated the DNA of a mutant, foul-mouthed child. 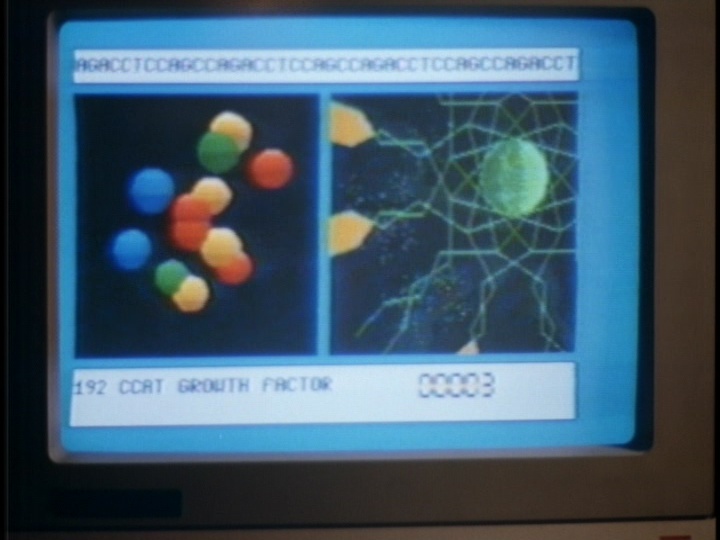 The Amiga 1000’s screen, displaying the genetic code our hero isolates in the film’s bass-licked music montage. 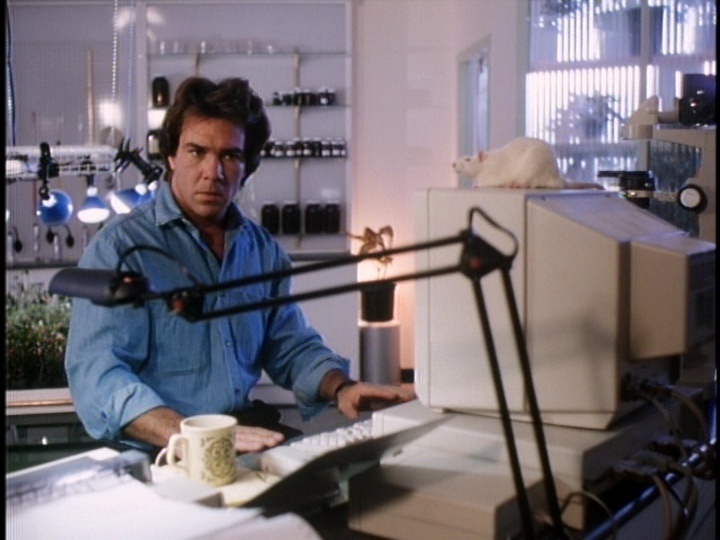 The hero (Paul Coufos) of Gnaw – Food of the Gods: Part II (1989), and close to the camera an ambidextrous IKEA desk lamp. Mine still works. Does yours? As for Gnaw being (more than likely) the first commercial film shot on the Keele campus, it is fitting that while first and second year film theory courses emphasized classic Hollywood film, documentaries, avant garde and experimental foreign films, the campus’ history resides not in a daring work of genre-bending indie experimentalism but a schlocky thriller in which horny coeds, dweebs, tightwads, pretentious activists, and synchronized swimming teams are rat chum. 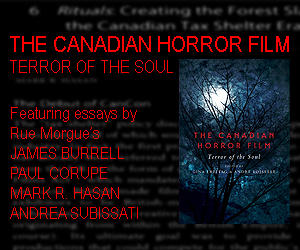 Bodies are mangled, liquefied, chomped, shredded, and turned into bubbling neon goo. 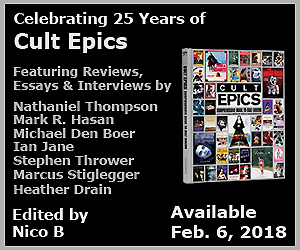 As the fog from almost 2 weeks of a nasty cold finally starts to clear up, expect a flurry of reviews, plus podcasts, now that I can talk a little longer without a major hacking fit. Whatever bug is working its way through the populace is pretty nasty – apparently the lingering cough lasts for additional weeks – but if this past weekend is any indication, spring is finally here.